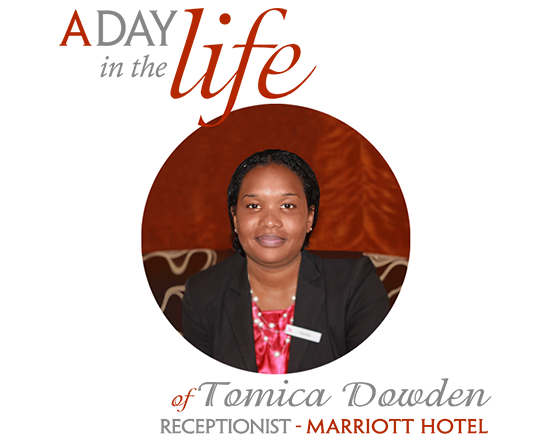 "This industry opens up many doors, and just by having this skill in the CV, as a receptionist, it's amazing. You're not just a receptionist, you're probably a chef by then, you're probably a first aider, you probably know how to fix a door or how to book a cab, so you're well rounded." What attracted you to hospitality in the first instance? I like the hospitality industry. I like what it brings to guests, I like that it makes people feel good, ensuring that when they are away from home they're being taken care of. So I suppose it was more the Customer Service side of it and getting to meet different people. What do you think are the advantages of working in hospitality? The advantage of working in hospitality is that you get to meet different people from different parts of the world. You can meet people from Japan today and someone from Korea or India tomorrow. Especially in a hotel, you work with a wide range of people and you get to interact with everyone. Dealing with various situations makes you more equipped to handle stress. I finished Uni and graduated with a degree in Criminal Justice. I know, hospitality is something really different than what I've studied. Back then my best friend was working at the Marriott and she was always telling me interesting stories about people she met from all around the world, and how amazing that was. In hospitality you get to deal with so many different situations that no matter what you've studied in University you have transferable skills. So the course did help me whilst working here. How many hours do you tipically work per week? Usually it's 40 hours per week, but hospitality can be demanding. You are required to go above and beyond and you may need to stay an extra 2-3 hours, sometimes even 10. So it's not exactly glamorous. A guest has a problem where they need your extra time and attention and your shift finishes at 20:00, but you're still dealing with them at 21:30. To offer top quality service you need to stay late sometimes. Every shift you are on you get a brief on what happened on the shift before. So you're up to date with everything that's going on. We talk about the hotel, we talk about maintenance problems, about the weather, about the guests. When that's finished you have to deal with the money side, you need to run security checks, fire safety checks. After that we print our reports. We liaise with different departments and you have to learn how to communicate with them. Even though I'm a receptionist, I need to know what's going on in housekeeping, what's going on in the kitchen, in the bar, the security. So you have to check upon different departments to make sure they are running smooth. How does the kitchen affects reception? Most of our guests require room service. So as a receptionist we also take orders from guests, we place the orders for them. We are dealing with all our guests' needs, from the moment they are being checked in. That's what's called "receptionist at your service". We take your order and we forward it to room service. If you call and say "I need shaving cream", we then take your request and we send it to housekeeping, so housekeeping can deliver the shaving cream. You want burgers, we take your order and we send it to the kitchen. So all departments have to work together. I suppose my work style is a tailored package. I offer the customer what he needs. Every customer is different, every guest has different needs and you, as a receptionist, have to tailor yourself for what they are looking for. For example, a businessman is coming in and he's looking for a quick and easy check in. Friendly, but at the same time quick. He's had a long day at work, he just wants to get to his room, hook up to his Wi-Fi, read his emails and just relax. However, with a group of teenagers I spend even 20 minutes talking about clubs and nice places to visit. I've learned that some mistakes are bigger than others. As a receptionist, one of the most important things you have to deal with is money and credit cards. That is obviously confidential and vital information. You have to be really careful when you type something in because if you make a mistake it can be very costly. I've also learned to communicate better and always maintain a high level of professionalism and competence. You can't lose your temper. The lessons I've learned I had to learn the hard way, but the mistakes don't reoccur. My name is Tomica, but the company's name is Marriott, and an unsatisfied customer is not going to blame Tomica, he's going to blame the hotel. I would say to them that this is a wonderful industry to join. I love my job, I love being a receptionist. 3 years ago I was probably thinking that I'd be working in The Home Office by now, doing Crime Statistics. But this industry opens up so many doors, and just by having this skill in the CV, as a receptionist, it's amazing. You're not just a receptionist, you're probably a chef by then, you're probably a first aider, you probably know how to fix a door or how to book a cab, so you're well rounded. There are different departments and you take a bit away from each of them. This is a good job to have so yes, go for it! I'm going to move on to corporate receptionist to a Law Firm. Back to criminality, but still a receptionist. It's something I'm really excited about. Corporate receptionist is a step further from hospitality and after that I aspire to be a PA.